Elaine Francis (Purdue) will co-teach the course called “Acceptability Judgments in Syntax: Theoretical Interpretation and Experimentation Outside the Lab” with Savithry Namboodiripad (University of Michigan). Did you know that in an alternate universe in which Professor Francis isn’t teaching Linguistics, she would be a writer for The Late Show with Stephen Colbert? Continue reading to learn more about how Elaine discovered linguistics, her upcoming book, chocolate icing, and the crazy dog named Luna. I discovered linguistics in my freshman year at the College of William and Mary, when I took a generative syntax class from Ann Reed. Having grown up in rural Southwest Virginia, I was thrilled to learn that my native Appalachian dialect has a systematic grammar. For my research paper in Prof. Reed’s class, I worked on double modals in Appalachian English, and remember reading Walt Wolfram’s wonderful book on the topic. After that class, I declared my major as linguistics. In senior year, I read Bernard Comrie’s Language Universals and Linguistic Typology, after which I became especially interested in relative clauses and syntactic categories across languages. I pursued these interests at the University of Chicago, where I completed my MA and PhD under the direction of Salikoko Mufwene. My other committee members were Amy Dahlstrom, Jerry Sadock, and Jim McCawley. My dissertation examined variation among members of the same lexical category in English, using Sadock’s Autolexical Grammar framework. My first faculty position was at the University of Hong Kong, where I taught English linguistics for three years. I enjoyed learning some Cantonese while I was there, and in collaboration with Stephen Matthews, I conducted research on syntactic categories and relative clauses in Cantonese. I also started working in experimental syntax during this time. I left Hong Kong in 2002 for Purdue University, where I have taught ever since. My more recent research has focused on the relation between grammar and performance, specifically with respect to word order alternations, filler-gap dependencies, and resumptive pronouns. I direct the Experimental Linguistics Lab at Purdue, where I enjoy working with graduate and undergraduate students. I have also enjoyed a long-term collaboration with Laura Michaelis from the University of Colorado. I am interested in developing new research ideas and collaborations, and I hope to find some during my time at the Institute. I first joined as a student member in 1993 as a senior at William and Mary, and attended my first annual meeting in 1996, as a grad student at Chicago. The meeting was in Chicago that year, where Jim McCawley gave a memorable presidential address on the relation between syntactic structure and logical structure. The title is “Acceptability judgments in syntax: theoretical interpretation and experimentation outside the lab.” I’ll be co-teaching with Savithry Namboodiripad from the University of Michigan. This course examines the use and interpretation of acceptability judgment experiments in syntax, drawing on two major themes: theoretical interpretation and community-based research. I’ll be mostly contributing to the theoretical interpretation part. I’ll give four lectures based on my book in progress, Gradient Acceptability and Linguistic Theory. We will start by examining how certain theoretical assumptions tend to influence how judgment data are interpreted within different theoretical traditions in syntax. Then we will talk about the current debate over how to distinguish between the effects of syntactic constraints and the effects of other factors, such as prosody, pragmatics, and processing. Finally, we will consider how additional data sources, such as corpus frequencies and production tasks, can help decide among competing theoretical interpretations. Savithry’s part will be more hands on. She will guide students through designing and potentially conducting an acceptability judgment experiment, with a special emphasis on understudied languages and populations. I’m mostly working on the book on which my lectures for the Institute course are based. The book explores how gradient judgment data have been dealt with in different theoretical traditions in syntax, and how linguists of all theoretical persuasions can make better use of converging evidence when interpreting such data. I’m also collaborating with some students and former students on experimental studies. One study with my former PhD student, Carol Chun Zheng (PhD 2017), examines the production of caused motion expressions in L1 vs. L2 English. Another study with my current PhD student, Josh Weirick, looks at discourse factors affecting the acceptability of relative clause extraposition in English. My favorite pastime is hanging out with my husband, Alex, sons, William and Robert (ages 14 and 10), and our crazy dog, Luna. I also enjoy softball, soccer, running, and hiking. As a kid, I admired David Letterman and wanted to be a writer for his show. So if that had happened in the 1990s, I’d probably have moved on to writing for Colbert by now. Of course, I look forward to teaching with Savithry and getting to know the students in our class. 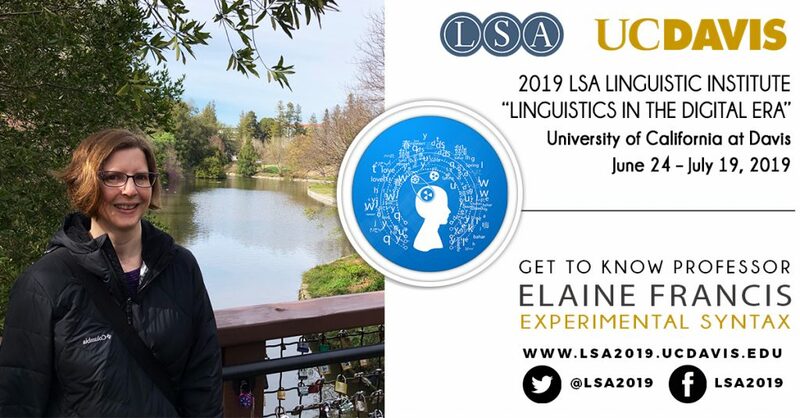 I’m also looking forward to immersing myself in linguistics, catching up on developments within and outside my own research areas, meeting new people, reconnecting with old friends, and enjoying the beautiful scenery. Chocolate cake with chocolate icing. Dogs. Semester. Gain some technical skills while you are in grad school, and take some classes outside your department. Try to develop a broad skill set and range of interests that can apply across different disciplines and outside of academia. Don’t shy away from “applied” fields like second language teaching, communication sciences and disorders, speech technology, or bilingual education. Also, try to take care of your physical and mental health. This is not easy during grad school, when there are so many unforgiving deadlines, but getting enough sleep, exercise, and nutrition will help you be happier and more productive in the long run.